The Punic Wars were perhaps the most critical conflicts in the history of the Roman Republic. The first war started innocuously when Rome sought to protect a band of pirates who lived on the northeast coast of Sicily. Carthage took the other side and the war was on. In order to combat the Carthaginians, Rome had to build a navy and by the time the twenty year conflict ended, Rome was in control of Sicily. The second war is famous for Hannibal's attack on the Roman peninsula after crossing the Alps. Hannibal spent fourteen years there, winning many battles, before he was forced to return home to defend Carthage against an invasion by Rome. The third war saw the complete destruction of Carthage in 146 B.C. at the hands of Scipio Aemilianus. These three wars over one hundred and twenty years led to the destruction of Carthage and achievement of supremacy over the Mediterranean Sea by the Roman Republic. 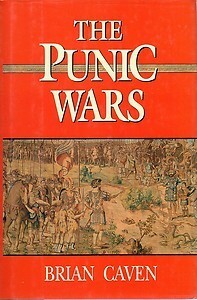 Sign into Goodreads to see if any of your friends have read The Punic Wars.